My most humour filled encounter was at a Queen’s Birthday celebration at the British High Commissioner’s residence in Pretoria, South Africa. Being a ‘locally engaged’ member of staff heading up the trade and industry public affairs section, one was expected to kind of not rock the boat by hogging ‘Mandela Time’. Under the watchful eyes of the UK diplomats (dips as we locals called them) every time I was in the vacinity of Nelson Mandela, I moved away to allow those who had not met him (of any rank, file, number and origin!) the opportunity meet and say a few words to this most iconic man. I first met him shortly after he was released from prison. 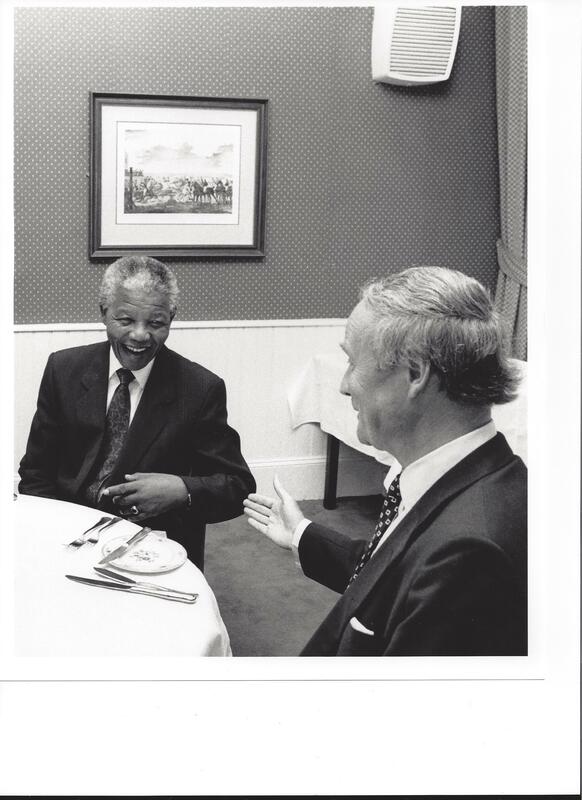 The then UK Ambassador to South Africa, Sir Robin Renwick invited him to lunch in the private dining room at Linger Longer, Braamfontein. I was tasked with abducting a freelance photographer, the late great Giselle Wolfshohn to do the photo shoot, which also included some deputy Ambassador who just, well kept jumping into frame – what a bore!! Back to the ‘Queen’s Party’ – as I kept walking around the garden trying to keep out of sight, Mr Mandela finally cornered me… aghast!! !He came up to me and said “Young lady. Why is it that every time I come near you you move away? I have been chasing you around this garden all afternoon?” The smile said it all. I replied ” I am sorry. I have met you a few times, and thought others should have the opportunity”. He laughed. Held my arm and asked “How are you”. One cannot ask for any more than that. As this great statesman ails, we all feel intensly for him. The political fight he overcame at great expense to his personal life. His savvy to accept only one term as president of South Africa (some could learn from this!). His stature as a leader and his ability to draw all to the table of compromise will never be forgotten.He is a man of magnitude – perhaps, once in a lifetime. Mr Nelson Mandela I thank you.